One of America's cheapest cars was reinventedas a luxury option by local makers AMI. See Unique Cars magazine for more stories like this. After the Standard Motor Company's tough, but agricultural, British Vanguard range slipped further behind the Holden during the late 1950s, its local arm had no choice but to evolve into a new entity - Australian Motor Industries (AMI). Beginning in 1960, this involved sourcing overseas substitutes to fill Standard's production lines. Among those chosen to hold the line were the Rambler American (from 1964) and its 1970 Hornet replacement. Under former British Army officer, Ken Hougham, the Rambler American was miraculously transformed from America's cheapest domestic car to a more expensive and prestigious Holden alternative by the AMI team. As the Vanguard's more sophisticated Triumph 2000 replacement became too costly to challenge Holden, and the Toyota Crown (also assembled by AMI) was a generation away from being competitive, Hougham's instincts for packaging the right car at the right time have never been fully recognised. AMI's assembly of the 'finnie' Mercedes-Benz 220S/SE ended in 1964 after the Stuttgart firm was forced to become an importer again. The smaller Triumph 2000 couldn't fill the gap because its price was inflated by the extra duty for parts that couldn't be sourced locally. Until the first Corona could replace the old-school Toyota Tiara and the ageing Triumph Herald (in late-'64), Hougham had a problem. 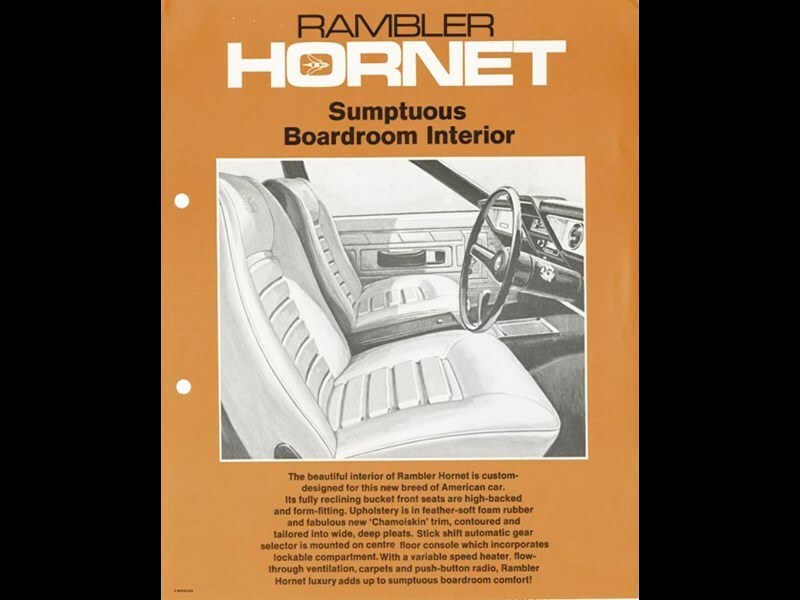 Although the bigger Rambler Classic/Ambassador models had quickly won local acceptance, they couldn't fill the gap either. But the entry-level Rambler range, with Richard Teague's fresh new styling, caught Hougham's attention. By adding the Triumph 2000's level of trim, carpet, paint, assembly quality, tyres and accessories, along with luxurious AMI-designed seats at the premium 330 (and, later, 440) US equipment level, Hougham ensured an enthusiastic local reception for the American. Never a big seller, the Rambler American - along with a locally-prepared Triumph 2000 and a rapidly-improving Toyota Crown - allowed Hougham to spread his bets over three outsiders. And all three delivered. Priced above Holden's $2614 EH Premier, the $2998 Rambler American lined up against the Ford Zephyr and Vauxhall Cresta, sporting a big 196 cubic-inch (3.2-litre) in-line six almost as powerful as the Valiant's 225. It matched the Valiant's class-leading performance, but with better fuel economy, a higher top speed, superior ride and grip, and a tighter turning circle. Because the American shared everything between the windscreen and the rear door trailing edges with the larger Classic, it shared the larger car's presence - even if it was shorter than the Valiant. The simpler and shorter front and rear body sections suited conservative local tastes, which might explain why the American is invisible today. Its superior ride and sure handling were useful advantages. Its front suspension was similar to the double-wishbone designs under Falcon and Chevy II bonnets, with their strut-type spring and damper mountings. At the rear, it was the usual live axle and leaf springs. 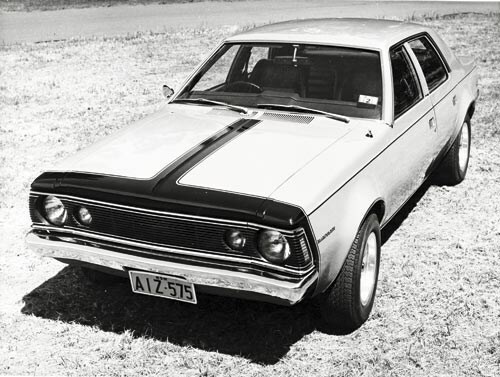 The American's robust, quality feel was let down only by its drum brakes, its low-geared steering, and a tendency to hit the bump stops over the worst Aussie roads. Its dual-circuit braking system was ahead of its time in 1964. The 'Flash-O-Matic' Borg Warner 35 auto option was unlikely to rip your pants off, as the name suggested, but it was as smooth and effective as any rival. And it would soon be shared with the local Valiant and Falcon. But Hougham and his baby Rambler didn't get an easy ride. Annual US upgrades, including a bigger 232ci (3.8-litre) engine in 1966, kept it fresh, but by 1967, the American's 106-inch (2692mm) wheelbase fell behind the XR Falcon's 111-inch (2819mm) benchmark, which Holden would match with its HK range in 1968. Hougham quietly retired the American that year as the Toyota Corolla and Corona, the new Rambler Rebel, and the Triumph 2.5 PI swelled AMI production. Indeed, by 1967, AMI's new Toyota Crown Deluxe had already made the American redundant in every area except width. Hougham didn't give up though. Stylist Richard Teague produced another clean new look, this time wearing the old Hudson Hornet badge, for a revived US compact market. AMI's 1970 repackaging of the Hornet again lifted it beyond its US origins. 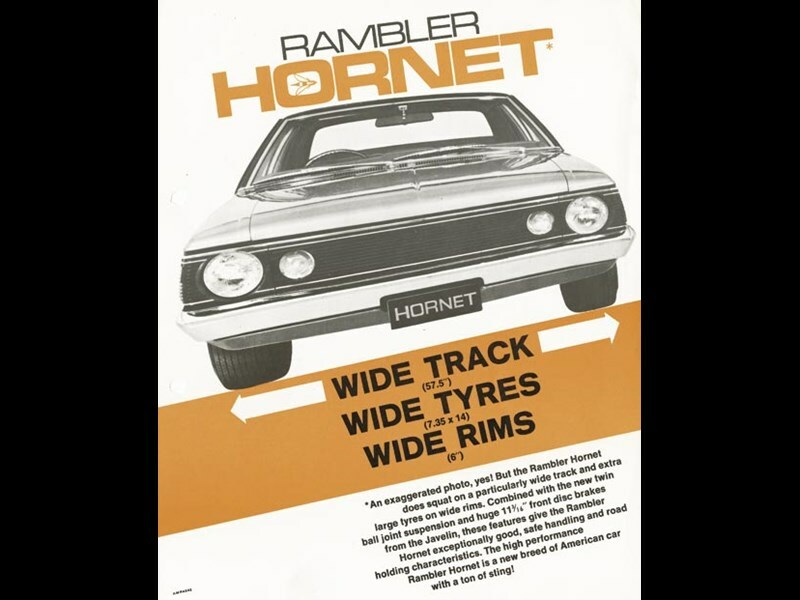 Hougham presented the Hornet as a premium, four-door Viagra alternative to a Monaro, Capri, Torana GTR, and the coming Charger. Hougham's exclusive Rambler Javelin and AMX coupes gave the new Hornet an instant muscle-car context. It arrived just as empty-nester World War II veterans only needed the rear doors to get their mates or wives to the local clubs and pubs. 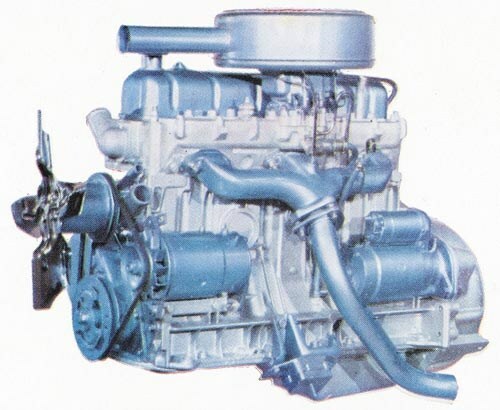 As an ex-serviceman himself, Hougham knew exactly where to add extra content to justify the $3999 price that lobbed it into the Brougham/VIP/Fairlane V8 market. 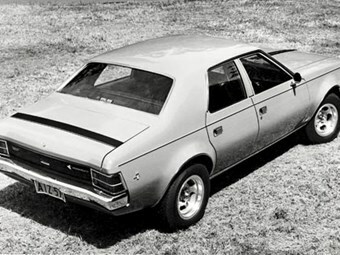 The key was its 108-inch (2743mm) wheelbase - same as the 1970 VG Valiant's but way short of its long-wheelbase class mates - with much shorter overhangs, a short boot, long bonnet, and wild (by 1970 standards) wheelarch flares. Depending on how much you squinted, the front said Mustang or Camaro. 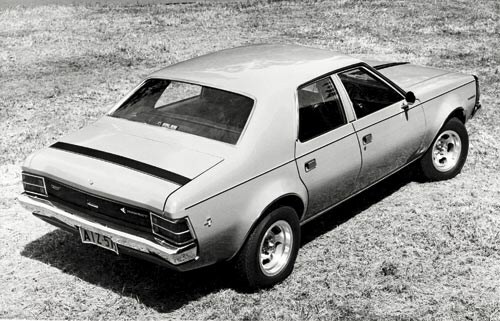 On Australian roads, it generated the same impact in 1970 as the VE Commodore did in 2006, each with remarkable similarities in proportion and stance. Hougham showed his usual insight by rejecting the V8 option, instead choosing the relaxed, but still frugal, 232ci (3.8-litre) six and standard BW35 auto with Australia's first pistol-grip selector in a sedan. Unique AMI-designed, high-back seats and matching door trims added to a spectacular cabin in 1970, and the fully-lined boot and covered spare wheel said 'top shelf'. Trim and paint were to AMI's usual premium standard. Despite its bright accents, the Hornet's dash was up-to-the-minute in design and lost nothing in the RHD conversion. AMC had been supplying right-hook models for rural mail deliveries in the US for many years, leaving Aussie Ramblers with fewer packaging and mechanical bugs than other US models. By now, Hougham was AMI's Managing Director and it showed. Mindful of the early American's shortfalls, he insisted on a local PBR fully-assisted dual braking system, a rear proportioning valve and massive four-piston front discs from the Javelin Trans Am cars. Front suspension was the beefy, heavy-duty, twin ball-joint V8 specification, with heavier coils, shocks and anti-roll bar, and a matching V8 rear axle, leaf springs and anti-roll bar. Local Hornets were SST specification (for Stainless Steel Trim), hence its wheelarch accents, sill trim, and tail-panel brightwork. The special US Hornet fuel cap option, standard on all Aussie-assembled cars, was a souvenir item from day one. The generic AMI full wheelcovers and chrome local mirrors were consistent with the Australian market in 1970. Early examples had Hella amber indicators on the bootlid until an amber section was built into the taillights a year later. A bigger 4.2-litre six arrived in November 1971, and new front amber indicator laws in mid-'73 dictated amber inner lights in the grille and parkers in the headlights. The wipers also moved to the correct side, plus there were new side-fluted taillights. This allowed AMI to get an extra year out of the 1972 4.2-litre series before the new, but less popular, rounded body arrived in 1974. Long-term Rambler owner Colin Main, from the AMC Rambler Club of Australia, suggests the 1970-71 model was the purest and most desirable, with 407 sold in 1970 and 597 in '71. As the Cortina XLE six, Charger 770 and refreshed European models were pitched at the same buyer, sales dropped to 355 in 1972 and 212 in '73. The Hornet's days were over as the less-desirable 1974 model plummeted to just 118 sales, then 136 in 1975. By then, AMI production lines were humming with popular Toyota Corolla, Corona and Crown ranges, and the facelifted Triumph 2000 in AMI's unique 2500TC specification. The Hornet, meanwhile, providing it could be prised from its original owner's grip, became the perfect candidate for a V8 transplant, leaving the few that escaped this fate highly-prized today.